There are apparently some 500 types of tarot cards in existence, and a proportion of these are designed for a specific purpose, one example of which, is the Inner child Cards. Most however, are new age fashion cards such as Dragon Cards, Witches Cards etc., and on the whole are mainly play things. True spiritual cards have to be based on the complete depth of human understanding that exists within a person’s character. It is also necessary that each card gives guidance and direction of that life at that moment of time. 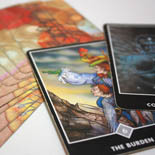 The pack that bests fits that needs are the Osho Zen tarot Cards. These again also have an instruction book which can be used by the less spiritual or unawakened being. Have a suitable size notebook and pen to hand. Pick the first card of the deck. Look at it – write the word down that is present on the bottom of the card. 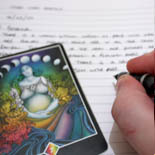 Focus your mind and your vision directly on the content of the card and when you start to form thoughts about what you see, write it down below the name in your notebook as completely as you remember. Repeat no.5 for the next card, then again for a third card. Stop. Leaving a minimum of 12 hours, repeat no.5 and no.6, selecting different cards on each occasion, and continue this procedure until all 79 cards have been covered. Make sure that you leave a sizeable space beneath each writing for future use. Once you have gone through the whole pack, you then repeat the process by going back to the first card and continue the whole process until all 79 cards have been done and the second writings are below the first writings. Compare the two writings for each card, and if you have opened yourself up to your spiritual guide, then the writings will show this by being more ethereal and different from your normal patterns of thought. It may be necessary to repeat the process for a third time, about 15-20% find this necessary. If one fails to learn this properly, one will find that your interpretations and readings have a tendency to be wildly wrong. Some people find their ability enhanced by doing a short meditation before studying the cards. When used properly, you will be guided by your spirit guide to give a reading as directed. A simple card can be chosen daily to make you aware of yourself and your mood. The use of the Osho cards as a spiritual tool make it easier for the person to open up their channel to spirit and strengthen and clear that channel. 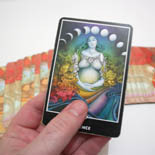 The cards are one of a few techniques which improve and heighten spiritual awareness and communication.